Current Status The Healy Lake Fire started on June 16, 2015 approximately 28 miles southeast of Delta Junction, Alaska. The cause was lightning. The acreage total today is 10,130. The fire is reported as 15% contained. The Michigan Creek Fire started on June 17, approximately 38 miles northeast of Delta Junction, Alaska. 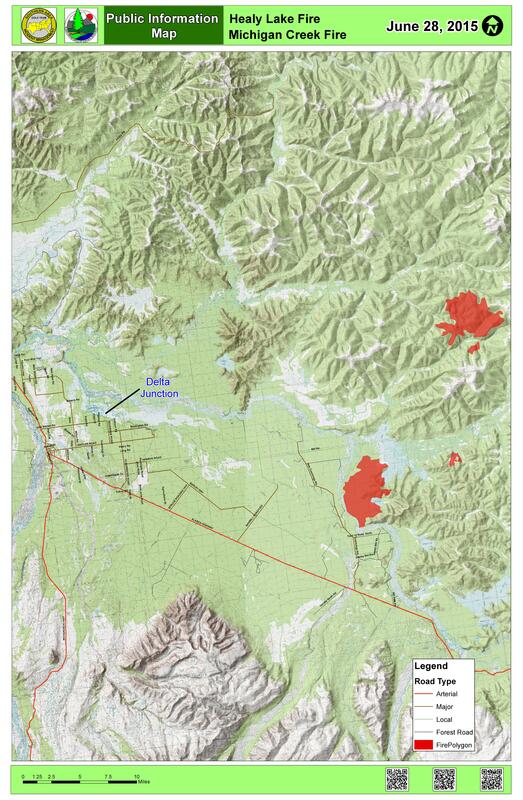 This fire is estimated at approximately 9,601 acres and at 0% containment. There is very little information available at this time about this fire, and it is in monitoring only status. Goals Healy Lake Fire – Plans are to 1) Ensure all suppression actions are prioritized, emphasizing firefighter and public safety through the implementation of sound LCES (Lookouts, Communications, Escape Routes, and Safety Zones), 2) Protect the community of Healy Lake Village and cabins on Healy Lake and Hidden Lake, 3) Protect Native Allotments, infrastructure and cultural resource values by coordinating with a Resource Advisor and following MIST (Minimum Impact Suppression Tactics), 4) Minimize traffic delays due to smoke impacts on the Alaska Highway. Healy Lake Fire – Crews will continue fortifying protection of structures and contingency lines south of Healy and Hidden Lakes and identifying areas for lines of protection for Healy Village. Mop-up of hot spots will also continue. Michigan Creek Fire – Reconnaissance and resource assessment will begin today. Equipment There are 2 light helicopters currently assigned to this incident; plus, 1 medium helicopter is based here and available, unless needed for initial attack of a new fire or other higher priority use. In addition, 1 air attack aircraft is based in Fairbanks and assigned to this incident. Other resources: 1 Type 1 Crew, 3 Type 2 Crews, 3 Dozers, 12 Boats, and 1 Water Tender. Fire Weather Partly Cloudy with temperatures in the low 60s with a low humidity of 58% and generally light winds from the southwest. Scattered rain and isolated thunderstorms are in the forecast.